for AS/400 & S/390 System Users! PLEASE NOTE: The Affirmative Extra Line of Thin Client Terminals is no longer manufactured. 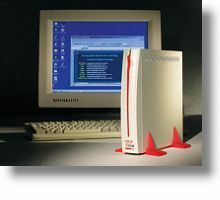 The current equivalent replacement is the Computer Lab International (CLI) AG6601 Thin Client Terminal. Click here for other CLI models available for use as "Ethernet Terminals". New 122-key keyboards are available for your current Affirmative Thin Client Terminals. These Windows Based Terminals (WBT) provide 5250 and 3270 Emulation for connection to IBM AS/400 and I Series as well as S/390 mainframes and Z Series. The Windows Based Terminals also provide connections to Windows Terminal Servers and Citrix servers using the Remote Desktop Protocol (RDP) or Independent Computing Architecture (ICA) client software. RDP connects to Windows NT 4.0 Terminal Server Edition (TSE) or Windows 2000 Servers, while ICA connects to TSE or Windows 2000 servers with Citrix Metaframe extensions. 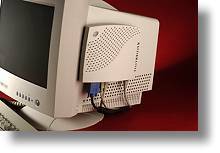 The YEStation� Browser Based Terminals (BBT) adds a local Internet Explorer 4.0 or Netscape 4.77 browser for access to web-enabled applications and Email. The WBT and BBT models share a common hardware platform, the YEStation� Extra. This machine has no local drives or other moving parts, and boots from local flash memory that loads emulation and client programs. The WBT version loads Windows CE, ICA and RDP Clients as well as terminal emulation for Midrange Mainframe and Unix hosts. Windows-based applications can be run from an NT server using either the ICA or RDP clients in conjunction with MS or Citrix application servers. 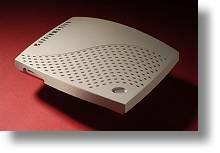 The YEStation� Extra Thin Client Terminal addresses the need to lower Total Cost of Ownership (TCO) of Personal Computers deployed in business networks. 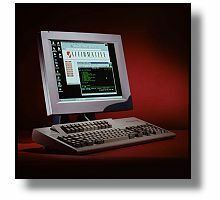 The YEStation� is especially designed to suit the needs of IBM Midrange and Mainframe computer users with its terminal-style keyboard options, built-in 5250 and 3270 emulation software, and TCP/IP network protocol. traditional PC and a Thin Client Terminal? 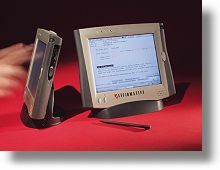 The YEStation� Extra can run Windows Applications as well as local terminal emulation software, giving the user access to AS/400, S/390 and Windows host computers, while the operating systems, applications and data never leave the host servers. This means file management is performed by IT professionals, and end-users are allowed only those applications authorized by management. There are no disk drives in the terminal, so it is impossible for the user to import, or export, pr ograms or data, yet they are able to run their authorized Windows applications from a Windows Terminal Server or Citrix Winframe and Metaframe servers. Optional Central Management Software is available for managing, configuring and updating the units over the network. Centralized, shared application software means you can update thousands of users in minutes without leaving your desk! How thin is the YEStation� Extra? Very skinny, only 8 by 9 by 1 � inches, weighing in at three pounds. The unit can be loaded with text- based "dumb terminal" software or it can be configured as a Windows Based Terminal (WBT) with access to Midrange, Mainframe, Unix and Windows application servers. Upgrades can be performed over the network, using FTP or SNMP ICA protocols. Both configurations use TCP/IP instead of SNA communications, thereby simplifying the network and reducing costs. Interface ports include parallel, serial (2), 10/100 Ethernet, USB (2) and audio in/out. There are absolutely no moving parts. All models of the YEStation Extra have a 3-year warranty with options to extend additional years. AIO is an acronym for All-In-One and this product certainly qualifies by integrating the logic and display elements to reduce the total desktop footprint to only 42 square inches (7 X 6). The software, loaded from local Disk On Chip (DOC), includes Windows CE and RDP, ICA, IE Browser Terminal Emulation clients and SNMP clients. Ports include Parallel, Serial (2), 10/100 Ethernet, PS/2 keyboard, PS/2 mouse, Audio in, Audio out, and USB (2). The AIO comes with a 300 MHz Media Gx1 micro processor, 32 MB of SDRAM, and 16 MB of Disk On Chip. The video resolution is fixed at 1024 by 768 and the LCD panel measures 15 1/8 inches viewable, which is comparable to a 17-inch CRT monitor. The YEStation� LE is a low cost Windows Based Terminal (WBT) with a suggested list price of $349, including keyboard and mouse. The LE is a small footprint device providing access to Windows Terminal Services via Remote Desktop Protocol (RDP) or access to Citrix servers via the included Independent Computing Architecture (ICA) client. YESmanager central management software is a no-cost option that works with the LE and all other Affirmative Thin Clients providing software updates and profile modifications across the network from a central point. YESmanager runs on Windows NT or 2000, but it can manage both Windows CE and Linux-based Thin Clients. Updates may be scheduled in advance or executed immediately. LE clients may be powered up and down on a schedule, thereby saving electric power allowing for updates even if the operator has switched the power off. The new YEStationMini family of thin clients just raised the bar for performance, while lowering the desktop space requirement. Built around an Intel�-compatible SIS 550 processor that can run either Windows� CE.NET or Linux operating systems, the new hardware platform is 35% smaller, 20% faster, uses 30% less power and is 29% less expensive than other thin clients. (Click here or on the pictures at right for more detailed information). YEStationMini has a very small footprint � only 7.75" by 6" by 1.5" � and can be mounted vertically on a wall or attached to a monitor. The unit weighs only 1.5 pounds allowing for optimal mounting options, and low shipping costs. The Affirmative Linux Based Terminal (LBT) provides capabilities not available with Windows Based Terminals running Windows.